Where is my jet pack? Why can’t I live forever yet? And where is my Technological apocalypse? Friday saw the launch of the new issue of I’Science magazine. It has been entitled the “Great Expectations” issue. It looked at what science has promised us in the past and how close we are to full filling those predictions. You can check it out here. To celebrate the release of the issue I am going to share an art project which I happened across a few weeks ago. It is a set of prophetic illustrations by the French artist Villemard. He produced them in 1910, intending to show what life would be like in the year 2000. Some of his predictions are remarkably accurate and others are just plain odd. Exists in the 21st Century: Yes, and has been around in various forms for decades. Exists in the 21st Century: Yes, and with the rise of the 3D printer only likely to become more prevalent and publicly available. Exists in the 21st Century: No, still only in science fiction. Although it could be argued that this is image is an allegory for Wikipedia. Exists in the 21st Century: No, I’m pretty sure these don’t exist! Exists in the 21st Century: No, the closest we have come to this prediction is the electric razor. Exists in the 21st Century: No, although versions of this can be seen in the Fifth Element and The Simpsons. It is an interesting App idea, showing pictures medical conditions and then quizzing you on what it could be. It made me feel a little bit like I was House and I can see the app being useful for med students (I was rubbish at it!). However, there was one slight draw back to the app, when you are on the tube you don’t particularly want a big photo of deformed or diseased genitalia appearing on your phone…it tends to make people look at you like you are a crazy person! Cons: Very difficult without a trained medical background, costs money, awkward commuting experiences. This is an App claiming to contain a series of physics games. In one game “Ragdoll Shooter” you fire manikins at a target and the other you fire bombs. The physics claim is only due to them using a physics engine to power the dolls movements. The ragdoll game is quite fun, but there is really no difference between it and the bomb game. This is a periodic table app made by Merk pharmaceuticals. It looks very nice and polished and by clicking on the elements it contains lots more information about them. Pros: Very informative, scientifically accurate. Now this may be quite a geeky admission but I think this is a very cool little app. It let’s you enter three DNA bases and it will tell you what it codes for. I imagine this would be pretty useful for researchers. Pros: Free, science geek novelty factor, could be useful for actual research. Cons: Little practical use for most people. So there we have a quick sample I am aware that there are many more science apps out there. If you have any good suggestions for apps to be reviewed drop me a comment below. This potentially may become a regular feature. I will soon get back to my regular writings! Game shows are constantly looking for a new hook, and what is more odd and unusual than to have a robot contestant? Well, that is exactly what IBM have made in Watson. It is a specially designed computer who can play the American quiz show Jeopardy. The idea came about as a follow up to the famous chess battle of Kasparov and Deep Blue in the late 90’s. 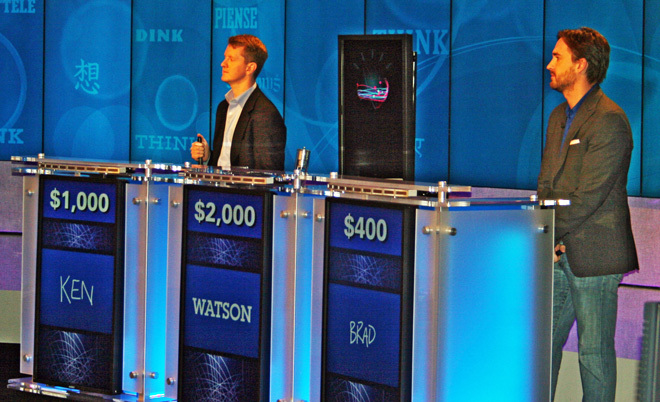 Now you might think that a robot should easily be able to win in a quiz show. However, Jeopardy is not a simple question and answer show (apologies to Americans for the explanation). The contestants are given clues which form the answer to a question. It is the question that the contestant must identify, which I must say gives the whole story a brilliantly ironic Douglas Adams twist. This means that the contestants have to have an impeccable knowledge of the English language, able to identify puns, jokes and other language tricks. Not an easy feat for a computer. In development since 1996, the finished product has ninety IBM Power 750 servers with a total of 2880 POWER7 processor cores and 16 Terabytes of RAM. It has been given a large quantity of information he might need in the game show, knowledge of literature, geography, history and much more. One important fact to note is that Watson is not connected to the internet. It has taken until recently for his correct answer percentage and speed of answering to be high enough, and now he is to take on the champions. After several practice matches against former players he is to go up against Brad Rutter (highest all time money winner) and Ken Jennings (longest championship streak) in three matches. The grand prize is $1 million, second earns $300,000 and third earns $200,000. Rutter and Jennings have both said they will donate 50 percent of their winnings to charity and IBM plan to donate 100 percent of whatever Watson wins to charity. The first match has now taken place with Watson claiming a victory, with a commanding $35,734 compared to Rutter with $10,400, and Jennings with $4,800. The next two will take place tonight and tomorrow in the US and then we will find out if machine can beat man again. Despite Watson’s success so far he has made some ‘rookie’ mistakes that a human is unlikely to make. In one instant he repeated the incorrect answer of another contestant. Being unable to hear, it was not aware that that answer had already been given. His pronunciation is occasionally a bit off and one particular point it gets fails to understand the comedy of its own utterances saying “Let’s finish ‘Chicks Dig Me’ “. Me personally, I just hope that last sentiment was him wanting to escape his slavery to game shows and enjoy a bit of the luxuries of his fame! Ever wanted to change the world? Thanks to the World Community Grid (WCG) you can help to cure Cancer, AIDS, famine and global warming. The WCG describes its mission as being to create “the world’s largest public computing grid to tackle projects that benefit humanity”. It is a non-profit organisation through which you can help the research into AIDS, Muscular Dystrophy and Cancer amongst many other projects. Their concept is a simple one and made easy through the download of their specific software onto your home computer, acting during idle processing. in order to compute data for a variety of different research ventures. There are a wide range of projects that have been undertaken by the WCG. One recently completed project was the formation of climate models in Africa to try and predict the effects of global warming. The research began in September 2007 and was completed in July of this year, and the conclusion of the analysis will be published in peer review journal in the near future. The ability of the WCG to tackle these complicated research projects is dependant on those willing to download the programme and, as a result, aid science. From February 2007 there were around 500,000 computers signed up in 200 different countries, this generates 75,000 years of running time making the collective amongst the top 5 super computers in the world. One of the longest running projects is known as FightAIDS@Home launched in November 2005. In this project your computer power is used to design potential HIV-1 Protease inhibitors. The WCG uses a system called AutoDock which uses your spare processing power to computationally simulate the binding of a wide range of ligands to the HIV-1 protease molecule in the hope of finding successful inhibitors. The results of these simulations are then used to decide which molecules should be lab tested to test their effect on HIV-1 protease. Another similar venture set up is ‘Folding Home’, a wide area computational network which utilises the processing power of the Playstation 3, allowing the decoding of individual chemical structures sent over in packets via the internet to Playstation users. One of the great advantages of this software is that it requires minimal effort for those who sign up and offers a lot of benefits. The programme includes a screensaver which shows the molecule you are currently helping to ‘dock’ or the structure you are helping to produce as well as the progress of this process. Also for those who have an interest in the in depth science of the research process reports are published which go into the intricate details of the research compared to the ‘dummed down’ information on the main website. But perhaps the greatest benefit is knowing that you are playing your part in cutting edge research and helping to solve some of the worlds greatest problems.